Advances in technology have opened many doors to us, not least in the realm of art criticism. Using x-ray machines, we are now able to look behind the paint and onto the canvas itself, often picking out early drafts, mistakes or major changes. Such an ability has often caused fundamental shifts in our knowledge of the way the great masters worked or even thought. This has never been more true than for David's famous painting, The Death of Marat. The story behind the painting is reasonably well-known. Jean-Paul Marat was a mathematician and social philosopher who rose to prominence during the French Revolution. As a publisher of a newspaper called The Friend of the People, he propagated the abolition of the monarchy. Following the Revolution, Marat was elected into the National Convention of France to represent the people. As his power and influence grew, so did his number of enemies. 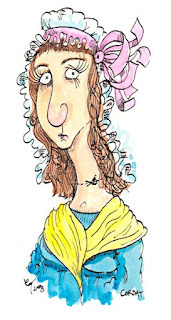 On July 13th 1793 he was assassinated in his bath - where he would frequently retired due to a chronic skin condition - by Charlotte Corday, an anti-Republican Girondin. Marat had, ironically, more or less retired from public life and service by this point. However, his popularity endured, and David had been planning to immortalise him in oils for some time. 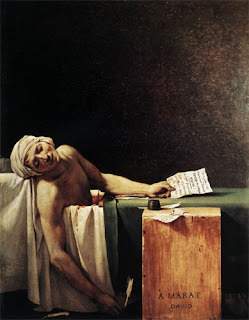 With a peculiar synchronicity, he had just finished an early draft of this painting when news of Marat's death broke. 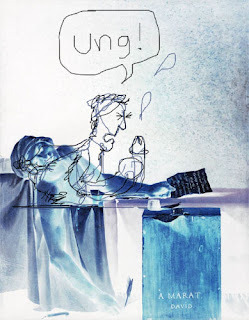 As we can see from the x-ray, David originally depicted Marat's bathtime activity as having a frenzied tug with his thumb up his arse. With a keen eye for history and drama, David hurriedly painted over the first image with the picture which has become the enduring portrait of the French Revolution. You want to tell Brian Sewell about this. Or send it to Sister Wendy. I think you could create a whole career out of this! what would you call it? graffiti, illustration, Post-Modernism? Sad thing is I, like many others I expect, thought this was a real post with real insights to the Death of Marat. I must have MUG printed on my fore-head, whats your excuse?